Are You an Emotional Eater? 8 Signs to Find Out Now. Are you an emotional eater? I know I was. Whenever I felt stressed out, overwhelmed, exhausted, or even sad, I would reach for food unconsciously to soothe myself. It wasn’t until I offered my first Trim-Life class that I realized I needed this program for myself. What I realized is that emotional and physical hunger can feel identical, unless you’ve learned to identify their distinguishing characteristics. The next time you feel voraciously hungry, look for these signals that your appetite may be based on emotions rather than true physical need. This awareness may head off an emotional eating episode. 1. It is sudden. One minute you’re not thinking about food, the next minute you’re starving. Your hungers goes from 0-60 within a short period of time. 2. It is for a specific food. Your cravings are for one specific type of food, such as chocolate, pasta or a cheeseburger. With emotional eating, you feel you need to eat that particular food. No substitute will do! 3. It is “above the neck”. An emotionally based craving begins in the mouth and mind. Your mouth wants to taste the pizza or chocolate doughnut. Your mind whirls with the thought about your desired food. 4. It is urgent. Emotional hunger urges you to eat NOW to instantly ease emotional pain with food. 5. It is paired with an upsetting emotion. Your boss yelled at you. Your child is in trouble at school. Your spouse is in a bad mood. Emotional hunger occurs in conjunction with an upsetting situation. 6. It involves automatic or absent-minded eating. Emotional eating can feel as if someone else’s hand is scooping up the ice cream and putting it into your mouth (“automatic eating”). You may not notice that you’ve eaten a whole bag of potato chips (absent-minded eating). 7. You do not notice or stop eating in response to fullness. Emotional overeating stems from a desire to cover up painful feelings. The person stuffs her/himself to deaden troubling emotions and will eat second and third helpings, even though his/her stomach may be full. If any of these resonated with you or if you had an “ah-ha” moment as you read through this list, you may be struggling with emotional eating. The good news is that I can help you overcome this once and for all! My next Trim-Life integrative weight release program starts on Monday, September 18th. We will meet online for 6-weeks together. You can read more about the Trim-Life program here. So, what are you really hungry for? 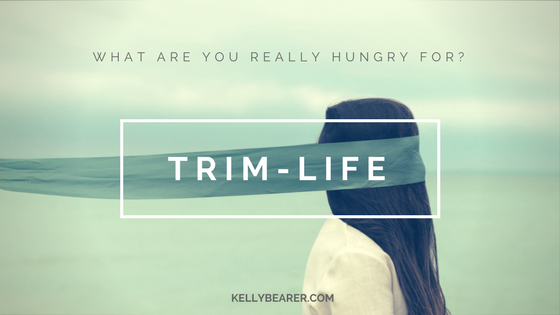 Join my Trim-Life group to find out!